So, in 2014, I was a front line sales leader at a Fortune 500 technology / software / services company. Yeah, I was far from being a salesguru who knew it all - I was just some guy, leading a national sales team spread out across the United States, with a vertical territory-based quota, working for a company that paid me to sell their technology / software / services to enterprise companies. I mean, what did I know about B2B sales? I didn't even have a blog! Anyways, my company had just released a new, big-ticket widget. It was really (all kidding aside) a revolutionary piece of tech and they (rightly so) wanted to plaster the world with it. So they sent me and about 50 of my national colleagues down to San Francisco for a two day workshop on what this widget did. At the end of the firehose-blast of training, my EVP gave me a "number" - this was the number of units my team and I had to sell my in my team's territory by a certain date. So you can imagine, when I got back to the Pacific Northwest, I was eager to scour the internet to find new 2014ish ways to connect with prospects that would interested in my new widget. Why the internet - why didn't I just call marketing and retool my Inbound process, you ask? Well, here's a note to sales gurus out there - when you're a cog in a $25 billion dollar machine, you have little effect on whatever "inbound" strategies your org is deploying corporate wide. 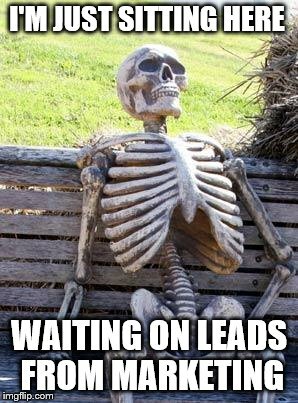 And when you have a number to hit - you simply can't wait on leads from Marketing. So rather than die on the beach in some Quixotic attempt to change the direction of the ENTIRE 7th Fleet, I scoured the internet in search of strategy and tactics I could craft and deploy to steer the little PT Boat I was commanding. When I scoured said internet, I saw a lot (A LOT) of "content" from sales gurus telling me how "hustle and grit" were the only way my team would succeed and that my "dreams are only dreams if [I] don't act on them." Funny, my bank has never taken "grit" as payment for my mortgage. And I don't think selling a boat-load of widgets was EVER a dream of mine. So, I passed on those gooey-feely sales nuggets. Mostly everything else was about COLD CALLING. Nothing wrong with that, if that's your cup of tea, but mind you, I was working in an industry that - for the last 40 or 50 years - had perfected the act. In fact, my industry religiously trained each sales rep to methodically dial 100 numbers or knock on 50 doors a day in order to sell our widgets to make EOM quota. The culture of the entire industry was a cold-calling culture & we had some pretty good prospecting training that had been crafted and retooled generation after generation after generation at my 76 year old (at the time) company. And if I may be so bold, you don't get to exist as a 76 year old company without knowing how to teach your sales people to phone or physically prospect for most of those 76 years. So, we had "that" covered. Since I figured gritty, dreamy cold calling training from someone outside my industry wasn't the secret sauce that was going to help me move product, I turned off the google-box and I called a few existing customers of mine. Not to sell them, mind you, but to pick their brains. One took me up on my offer to do some pickin'. 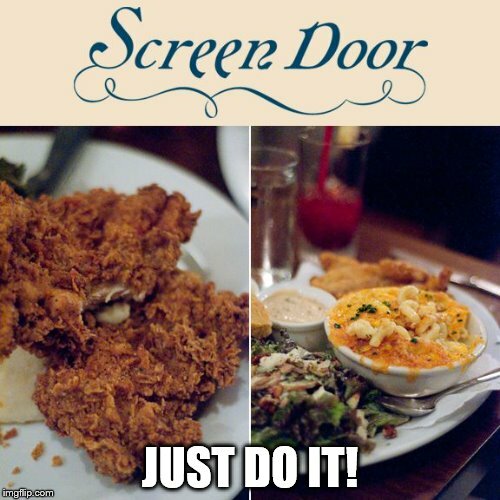 So armed with the binder full of data from the two day bootcamp, I took this buyer from one of my enterprise accounts to dinner in Portland Oregon, at a little place called The Screen Door - if you've never been, the fried chicken is the stuff real dreams are made of. We ordered and I let him peruse the content my company had provided me - all the bells and whistles and speeds and feeds and everything that the marketing people had determined was ESSENTIAL to selling our new widget. So halfway into the buttermilk-battered goodness, my mouth half full of homemade mashed potatoes, I drank some water, wiped my mouth and asked my client/friend. "So what do you think." He looked at me, fork in hand and looked down at his plate, and said "This is sh*t."
"The chicken?" I said - I though - was he crazy? Did he have no sense of taste? The value I was about to put on any opinion this person had in anything was plummeting quicker than my 401k did in 2009 (ouch, too soon? ), when he shook his head and his fork back and forth. "No Derek," he sighed, "the chicken is 5 freakin' star....your content, all this stuff you want to sell me on...it's all sh*t."
The look on my face - most likely my gaping maw - casued him to chuckle and ask this question "Why did you show me any of this stuff?" He motioned with his fork to the stack of paper next to his collard greens. I replied "Becasue that's what I want to educate you on. 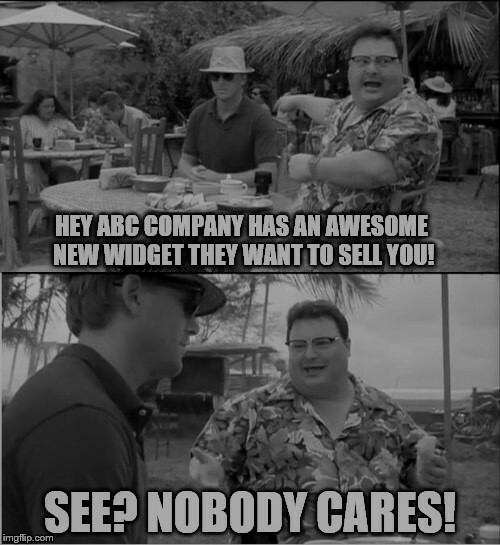 Why you should buy our new widget." I dropped my fork, and looked at him, "So what do you care about? How can I reach out to you - or people like you - to inform, educate and offer insight if all of this marketing stuff is sh*t?" 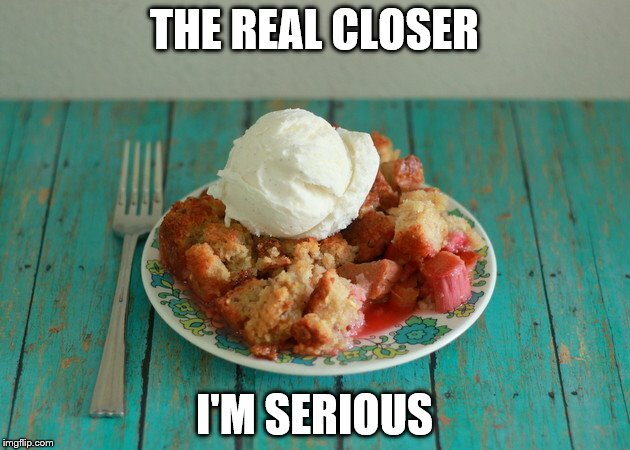 He said, "Buy me a Apple Rhubarb Brown Betty for dessert and I'll tell you." Over dessert, my client (who ended up buying one of the new widgets ANYWAYS - because it really WAS a great widget) helped me craft a process - a way in which I could reach out to prospects and get them interested in speaking with me about that particular widget. Over the last few years, I've generalized what I learned that evening, and have retooled it for different products/services, and it seems to work...because I believe it's focused entirely on THE CUSTOMER and not on me or my company. At least not until I can figure out how my ANY OF THE ABOVE helps them with something THEY CARE about. Sure - we've all read about the slick tricks reps can use when writing sales emails - like WHEN you send them or WHAT the subject line should say - but honestly, so have our prospects. If you're looking for that, this ain't it. This webinar is how to craft personalized prospecting emails that get noticed and get acted upon by your prospects. Regardless of what you're selling. Because what you're selling DOESN'T MATTER. That is, until your customer SAYS it does - right?